Terake’s Operational Plans and Mobile Task Management application help you quickly and efficiently coordinate your team. Simply fill all the right fields, with the right products, in the right settings and at the right time. Terake is a company management software that makes it easier for the company, replaces spreadsheets, improves teamwork, monitors the company’s profitability on a daily basis in real time. Terake is a fast, simple, and accurate working time measurement helper that helps you continually fill in the necessary information with the fieldbook and keeps your costs of business under control. Terake saves a lot of time and money to the user – machine costs, supplies and materials, working time and management costs. All data is puted in the work by the worker in the work process, which provides the most accurate and exchange information. The API makes it easy to synchronize data with other applications. Terake software can inherit object, dates, employees, time, materials, etc. From 19th September 2017 to 18th September 2018, EAS (Enterprise Estonia) supported Tehnoloogia Rakenduskeskus OÜ to develop their application software within EAS Start-up Programme. 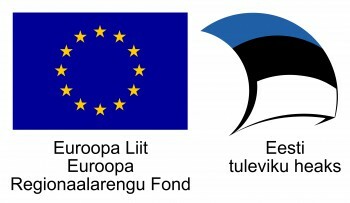 The project is supported by the European Regional Development Fund and the grant amount is EUR 15,000.